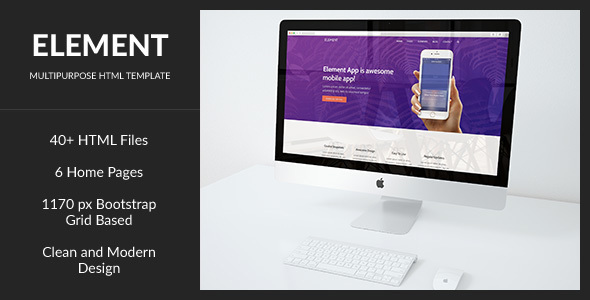 Element | creative multi-purpose HTML template | is a great design idea for building simple and beautiful website for business or personal purposes. Element contains 6 home page layouts and more than 15 different elements: footers, headers, menu, pricing cards. Element has clean and minimalistic design focusing customer’s attention on main information of your web-site. The documentation is easy and user-friendly that’s why you will be able to customize the item yourself. Element will represent your business in the most modern, effective and convenient way. All images and icons are used for preview only and not included in the final purchase pack for download. Answer the QUESTIONS VIA LINK.